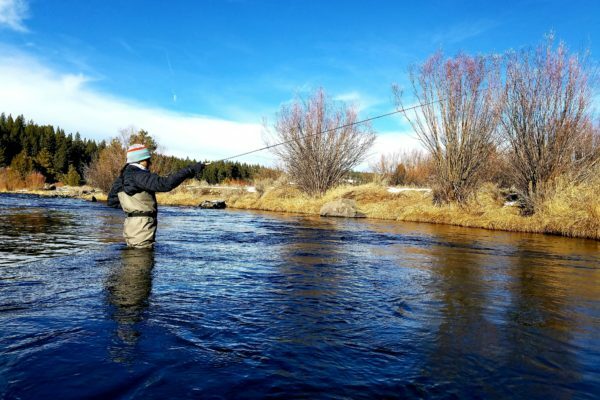 Fishing on the Truckee River has been good one day and tough the next. 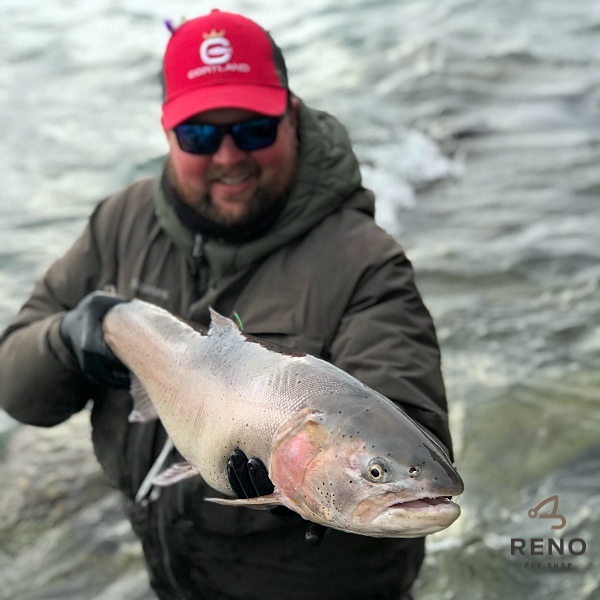 Colder temperatures and fluctuating flows, due to recent storms, have put the fish into a different pattern of feeding. It seems as if the fish are eating a few times a week. This has led us to jump from spot to spot as sections of the river will fish poorly one day while other sections fish better on the same day. 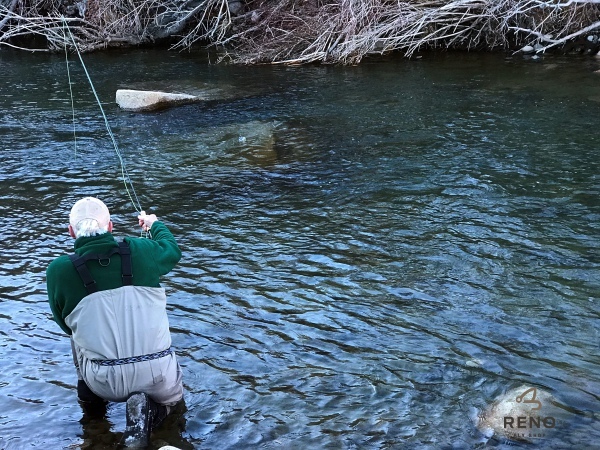 You want to be sure that you are covering water effectively, but do not stay at a spot that is not producing fish. Baetis hatches have been rare and sparse. Look for these to pick up again at the end of the month and into February. Skwalla Stoneflies are also starting to make an appearance on the river!! A guest getting low in cold clear water. European Style nymphing has still been effective as feeding fish are at the head of pools and the slower seams. Switching to a lighter weighted rig and casting further up and across has been more effective as heavily weighted rigs do not drift well in slower water. 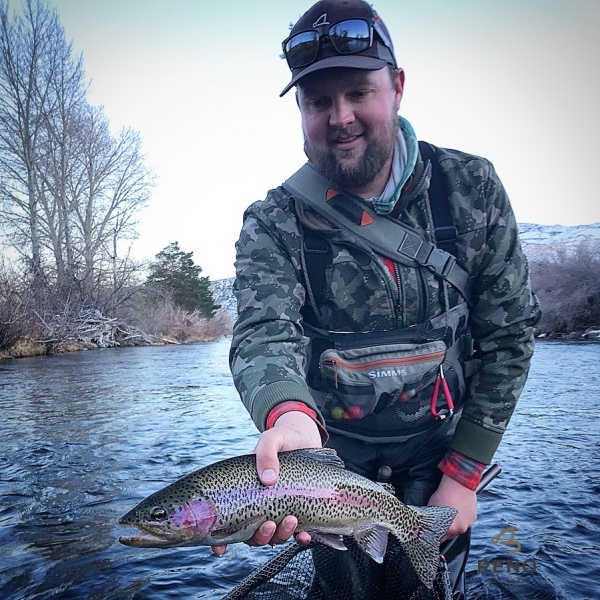 Fishing with Indicators has been effective too specifically in deep pools where fish tend to school when not actively feeding, but be assured they’ll take a well presented fly that is in their wheelhouse. Flies have not changed much, but focus on changes in water level and turbidity as storms bring moisture to our area and up system. Worm flies can be very effective in the fast and dirty water these storms produce! Mike on a well deserved day off. 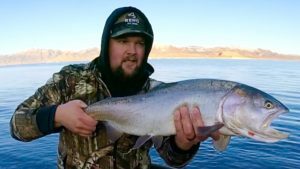 The storms that have made river fishing tough have brought a lot of large fish into the shallows. 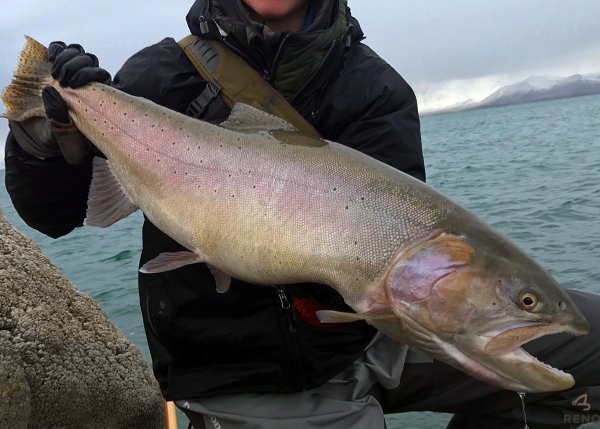 Larger fish are being caught daily seemingly all over the lake. 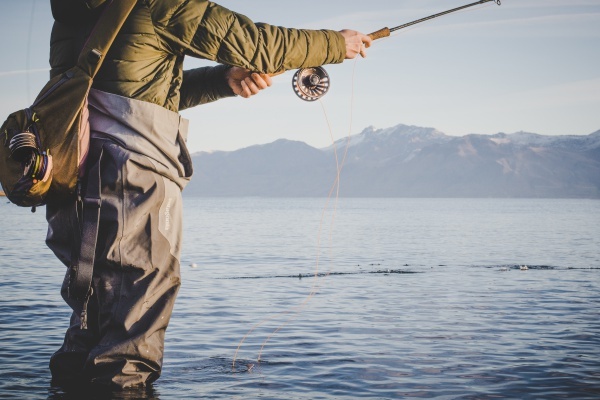 Floating lines with or without an indicator have proved to be more productive with some fish still being caught on the retrieve on shallow angled beaches. 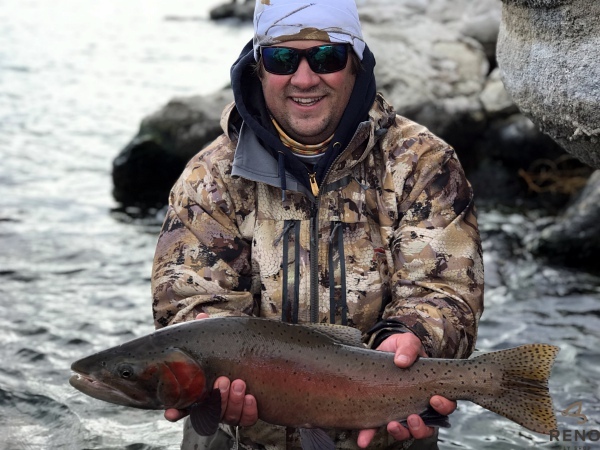 You have to capitalize on every bite that you have as the fish are only coming in to feed a few times a day. 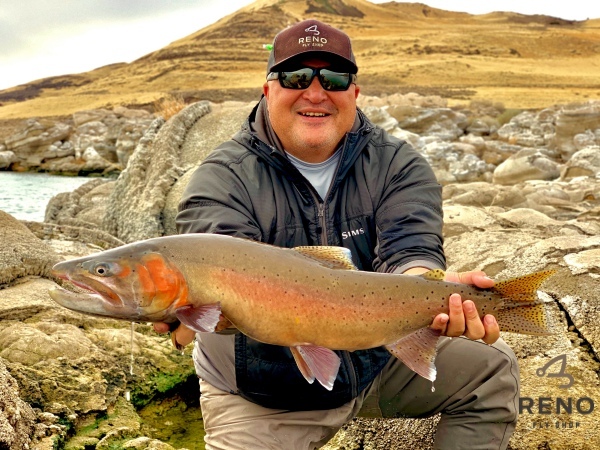 The overall size and quality of the fish has been impressive with every trip this past week ending with a double digit fish. 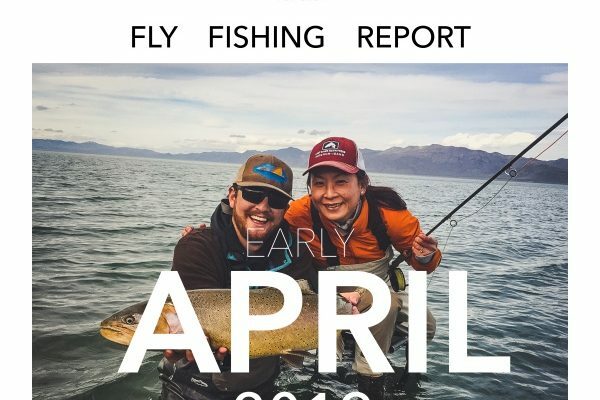 It is definitely the time to get out tothe lake and catch your trophy Lahontan Cutthroat Trout. Wine and copper midges and darker balanced leeches are my go to indicator set up. Midnight cowboy wooly buggers and diablo boobies are also the ticket for retreiving flies. Happy guest at Pyramid lake. Mike has openings in his guide calendar. Call today.